Zlatko Cosic, Story 2: Scenes 1-9, 05:00, 2017, Yugoslavia. Being able to tridimensionally process images on digital devices allows the video artist to materialize his/her ideas through philosophical approaches of the virtual space, approaches that consider reality the base for future premises. We discover, therefore, a virtual labyrinth of ideas that counts on the numerous self-referential elements, apparently simultaneous and arbitrary, dominated by an aesthetic, conceptual chaotic diversity; contrary to this, the video image is an interface between reality and the artist’s video-conceptual subject. 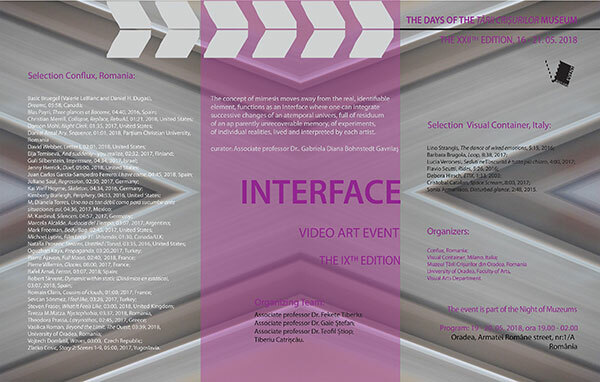 INTERFACE |Video Art Event, IXth edition will be presented from 05. 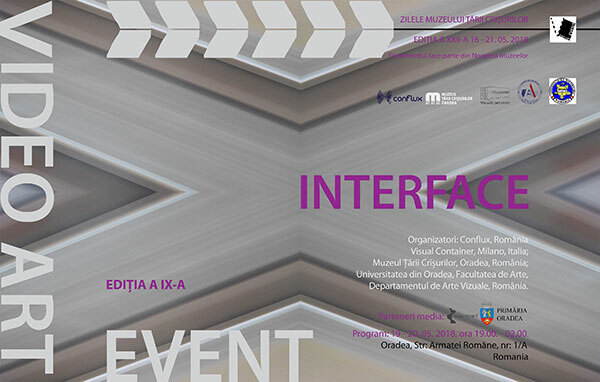 19-20, 2018 from 19-02 PM at the White Night of Museums to The Museum of “Ţǎrii Crişurilor“ in Oradea within “The days of Țării Crișurilor Muzeum“, University of Oradea, Visual Arts Department, Faculty of Arts, Romania and in June in Italy at visualcontainer.org, visualcontainer.tv, box Videoart Project Space Milano, dotbox.it.